Category: Leaflet Design, Flyer Design, Advertising, Print Design, Co. Galway, Ireland. Client: Ballybane Enterprise Centre, Ballybane, Co. Galway. Category: Leaflet Design, Print Design, Marketing Material, Kiltimagh, Co. Mayo, Ireland. Client: The Park Hotel, Kiltimagh, Co. Mayo, Ireland. The Park Hotel, Kiltimagh, Co. Mayo, Ireland, first choice accommodation base for leisure breaks, weddings and business meetings in Mayo and the West of Ireland. When visiting the West of Ireland, the Park Hotel, Mayo is the perfect holiday base from which to discover the many tourism attractions of Mayo, Sligo, Galway and Ireland’s West Coast. This marketing literature aims to promote weddings in the Park Hotel and their recent Wedding Fair. At the Park Hotel they have a team of experienced experts and friendly staff to ensure that your wedding day is a memorable and special one. We hope that this marketing literature will prove successful for The Park Hotel, securing hundreds of clients along the way. We printed this leaflet on uncoated paperstock, including a paisley design to give it a more organic feel. At Designwest, we will create various wedding communications to suit your needs including invite, booklet and stationary design. Category: Logo Design, Marketing Literature, Booklet Design, Press Ad Design, Dublin, Ireland. Client: Contact Centre Management Association. The CCMA awards brief was a job that we at Designwest really enjoyed getting our teeth stuck into. For this logo design we really had a clean sheet to work off as the previous designs that had been used for CCMA did not have a specific logo design or branding design concept. The end design is a very clever logo design – the outline of a figure, symbolizing a winner, is created in the negative space of a series of keywords that reflects the values and goals of the CCMA. The asterix which replaces the head of the person refers back to the line ‘people promoting excellence’ which is the embodiment of the awards. The project also required press ad design, booklet design, brochure design, menu design and many other elements. We originally created the CCMA logo design in 2009 and still work with CCMA for the awards ceremony every year, most recently in 2012. Category: Brochure Design & Leaflet design, Bangor-Erris, Belmullet, Co. Mayo. 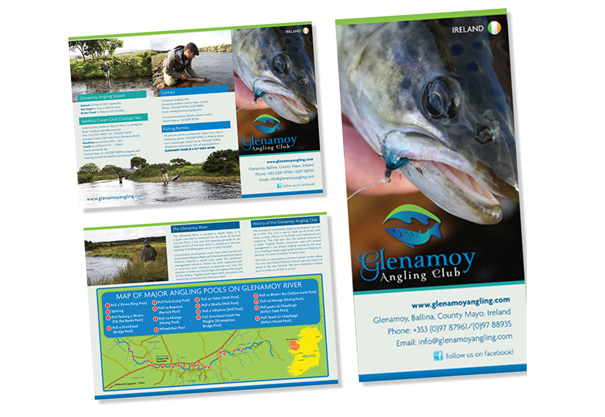 The Glenamoy Angling club approached designwest in early 2011 to create a logo design for the fishery as well as a website and finally a brochure design and leaflet design. The dl leaflet design for this Mayo based club is primarily based on exactly the same information that featured within the website. Designwest recreated user friendly maps for potential tourists which note all of the named fishing pools on the river. The brochure design also feature some fantastic angling photography which was taken by a professional photographer specifically for this brief and it really grasps the beauty of the landscape that surrounds this river in North Mayo and even captures a beautiful and majestic Salmon being played by an angler on the river. This brochure design is sure to wet the lips of any prospective angler that sees it! Tagged with: Bangor Erris, Belmullet, Brochure Design & Leaflet design, Co. Mayo, Glenamoy Angling Club, Ireland.